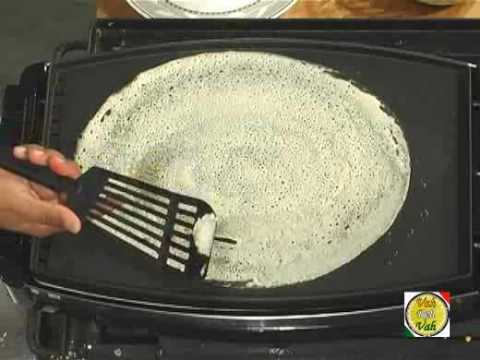 Dosa is a south Indian crepe recipe made of Rice and black lentils. Different variations can be done, Red chutney or Podi is spread on the Dosa, served with potato. Masala Dosa is a variant of the popular South Indian food Dosa, which has its origins in Tulu Mangalorean cuisine made popular by the Udupi hotels all over India. Medium onion (chopped) – 1 number. Large boiled potato – 2 numbers. Turmeric powder – half tea spoon. Green chili – 2 numbers. Yellow split peas – half tea spoon. Mustard seeds – 1 cup. Separately soak rice and urad dal at least 6 hour or overnight in water. Mix together & add salt with water to make batter. Leave in room temperature overnight. Mix onion and chilies to the thin batter. Heat pan or griddle with little ghee or oil. Spread the mix on pan in circular motion to make thin Dosa. Cook on both the sides, if desired. Heat oil. Add mustard seed, peas, onions and spice. Fry for about 5 minutes on medium heat or/until onions are turned into golden brown. Add potatoes and mix and cook some more. Serve by adding filling inside Dosa and roll.